Whether or not a disaster is man-made or natural, many businesses won’t successfully weather the storm. In fact, research by the Federal Emergency Management Agency (FEMA) found that 40% of small businesses won’t reopen after a natural disaster. Unfortunately, even of those that survive the initial catastrophe, 20% will still close within the year. What’s more, FEMA experts predict that 75% of businesses without a continuity and disaster recovery plan will fail within three years of a disaster. All that being said, there are a set of best practices to ensure your business doesn’t become a statistic. You may live in an area where natural disasters are rare or you may feel like small businesses aren’t impacted the same way large corporations are. However, in reality, most of the United States is at risk for some kind of natural disaster and the impact on small businesses is often greater than their larger counterparts due to weaker emergency preparedness protocols. To appropriately prepare for the variety of hazards that may affect your organization, it is critical that you establish a business continuity and disaster recovery team. Moreover, it’s important that you clearly define the roles and responsibilities for each team member as well as outline them accurately in a written plan. In this emergency plan, identify the chain of command, the succession of management, and any internal and external organizations that need to be contacted should disaster strike. To do this, ensure you have all team and employee contact information, emergency contact information, and clearly define each person’s specific role. Companies should align with an IT provider that specializes in disaster recovery to have their continuity plan assessed. If a catastrophe occurs, they’ll ensure your data, servers, and networks are up and running again as quickly as possible should disaster strike. Moreover, high-quality IT vendors will provide training and support for employee and in-house IT departments as well as provide cloud services to ensure that your recovery plan is foolproof and your data is safe. Does my business have a backup solution or a recovery plan? Is my backup data ever validated? Do I have my data stored at another location? Do I know the retention length of my data? Is my email backed up? How long can my business operate if there is a data failure? If any of these questions raised concerns, it’s important that you contact an IT provider sooner rather than later. Because the truth is this: the average daily loss for small businesses that close due to a disaster is $3,000, and for medium-sized businesses the cost is north of $23,000. Operating at that kind of a loss for any length of time puts your business in immediate jeopardy of closing down permanently. This is even more concerning, given that small businesses account for 99% of all companies and employ 50% of all private sector employees! Do I regularly install patches to my software? Do I regularly update my antivirus software? Have I installed a firewall on my computers? Again, if you answered no to any of these questions, your risk of a cyber-attack is significant. In addition, many larger companies won’t do business with organizations that lack appropriate cyber security measures due to supply chain interruptions and loss of intellectual property and private data. It’s likely that all businesses will deal with a disaster, natural or otherwise, at some point in their lifetime. Should a disaster occur, it’s important that organizations let their customers and stakeholders known as soon as possible. However, if you’ve aligned with an IT provider that is experienced in handling and executing disaster recovery plans, you can minimize the damage and ensure your employees, customers, and data are safe. Despite most organizations’ understanding of the dangers of a natural disaster, Ad Council found that a whopping 62% do not have an emergency plan in place to protect their employees, data, and business infrastructure. 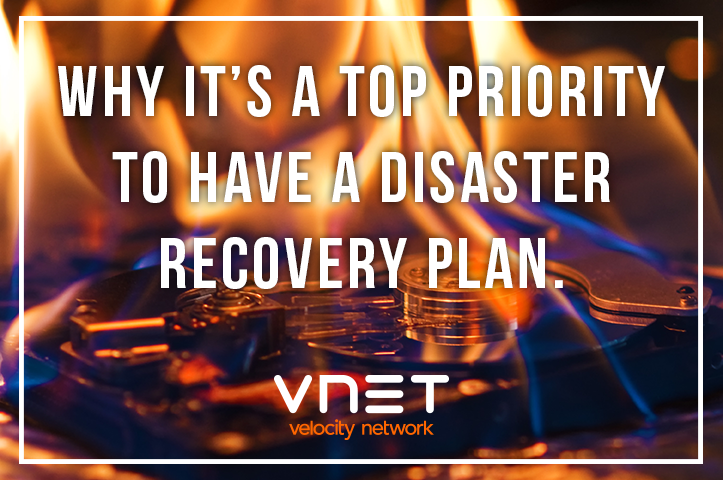 Secure your organization’s future by investing in a backup/disaster recovery plan with Velocity Network. Whether you need full IT support or simply a vendor that can align with your in-house IT team, we can assess your existing and future needs and customize a plan to your exact organizational needs. If you’re interested in learning more, call us at (814) 833-9111 or click here to contact us today. If you've never heard of VNET, let's get you up to speed. We began in 1990 as an IT services provider (SOFTEK) and later revolutionized the region’s internet offerings with the launch of Velocity.Net (ISP) in 1996. Since then, we have grown to become the region’s leading internet, business technology, and voice service provider. Today we are expanding our commitment to the community by investing in a next generation fiber optic network - designed to deliver world class speeds and services, but with local service and support to homes and business throughout Erie County. Interested in finding out if VNET is a good fit for you?